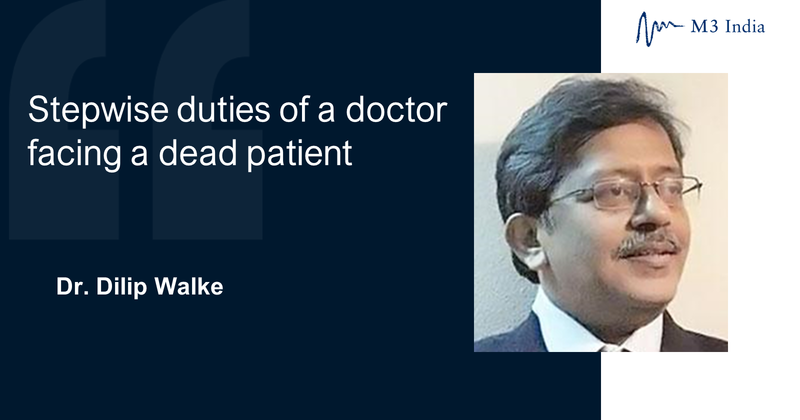 Dr. Walke, Past Chairman, Ethics and Medicolegal Committee FOGSI guides the reader in dealing with patient death in a stepwise manner- diagnosis, declaration report, handling the authorities, and handling the mob. In view of the rising incidents of the intolerant behaviour of patients and their relatives towards healthcare professionals, it has become extremely important that all medical professionals in general and the resident doctors, in particular, understand their statutory and regulatory responsibilities while handling a dead patient. Who should diagnose and declare? Amendments in the THO Act (2011) have allowed selection of a surgeon/physician and an anaesthetist/intensivist, in the event of the non-availability of approved neurosurgeon/neurologist. What would the team confirm? Is the patient deeply comatose due to irreversible brain damage of known aetiology? Are all brain-stem reflexes absent? All the prescribed tests are required to be repeated, after a minimum interval of 6 hours, “to ensure that there has been no observer error” and to document the persistence of the clinical state. Please note: It is also affected by hypothermia, drugs and metabolic diseases. If the cause of death is known and it’s a natural death e.g death following a disease or malfunction of the body: DC can be given by the physician who has attended the patient within 14 days prior to death (no such '14 days' rule/case law exists in India, but it is prudent to follow it as it has become a norm). In case of unnatural death and in a medicolegal case if the cause of death is known: DC should be handed over to the police along with the dead body for final ‘Panchanama”. The investigating officer may choose to accept the DC and hand over a copy to relatives for final cremation. But, the investigating officers may also be suspicious and may still want a medicolegal post-mortem. In case death has occurred because of old age the cause is 'senility': If the patient was never attended by the physician in past 14 days the local corporate can certify the death due to senility. Several general practitioners have to succumb to social pressures to give DC in such situations.